This is the Great Planes 5.5" Easy-Touch Hand Sander. The Easy-Touch Hand Sander is so well made that it could easily be the last sander you'll ever need. It's so versatile that it can be used on model boat hulls and bookshelves, miniatures and scale models, doll houses and home improvements with excellent results. It's so light and comfortable in your hand that it allows easy handling and precise control wherever it's used. Plus, adhesive-backed Easy-Touch sandpaper rolls created for Easy-Touch Hand Sanders are perfectly sized for use - simply trim to length. Specially contoured handle allows thumb and forefingers to wrap around for a full-hand grip, easing fatigue as it aids control. Lightweight aluminum reduces weight, so it can be moved over work surfaces with a light, easy touch. Extruded aluminum construction allows the sanding bed to be just 0.055" thick, yet resist twisting and bending. Remains flat to within ±0.008", to ensure even sanding. Will not allow sandpaper to gap or bunch up. Uses adhesive-backed sandpaper, for a no-slip grip that covers the entire sanding surface. Compact sanding bed size (2.25" x 5.5") offers no-waste economy in sandpaper. 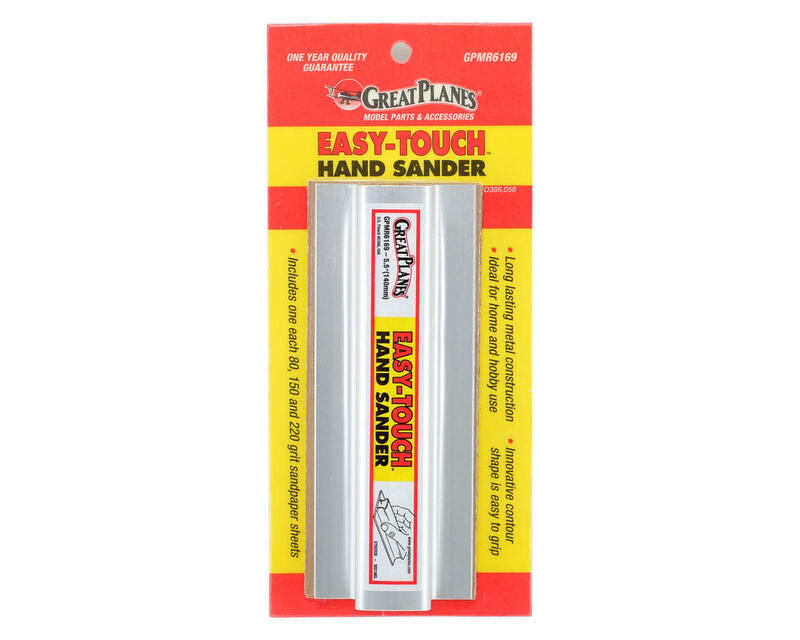 The 12-foot, adhesive-backed Easy-Touch sandpaper rolls created for Easy-Touch Hand Sanders are perfectly sized for use - simply trim to length. Includes one sheet each of adhesive-backed 80-, 150- and 220-grit sandpapers.